14 Gallon Biocube, Skimmer or Not? Hello all first post here, basically I have a 14gallon biocube and I was wondering if I really need a protine skimmer in it. Also if recommending I do need one, what kind of skimmer would you recommend be put on it. Please not that I so keep up with a weekly water change! i would say no, but i dont know how heavy your bio load is. Probably want something like tunze 9002 if u go that route. But I don't know, I've kind of outdated on equipment nowadays. Well I got 1 TINY blue tang, 1 court jester goby, 1 pistol shrimp, 4 snails. For coral, I got 3 different types of zoa's, 1 plate coral, 1 birdsnest and 1 stylophora. All appear to be doing great, I just want to be sure I'm doing all I can to allow them to thrive. errr it's hard to say whether you or not you need one. You technically don't need a skimmer if you're doing your water changes. The best advice I can give you is monitor your parameters. If it gets to dirty or ur sps aren't doing well, get a skimmer if u want. Otherwise I would just wait and see how things do. Ok ok! Thanks for the advice, just out of curiosity why should I have not mentioned the tang? Can't tell if you're joking or not, but a tang (no matter WHAT size) does not belong in a 14 gallon. Wasn't joking, honestly he is only in there temporarily to rid of a calerpa problem, he is soon being moved to a 90 gallon! I personally feel that these small "skimmers" are a waste of money for these small tanks. I agree with everyone else..save your money and just do the water changes. I have tried the oceanic biocube skimmer and compared to my sump skimmer on my 150 gal reef tank...its a joke. I spent so much time adjusting that thing. 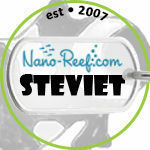 Im a huge fan of 1) live rock 2) chem pure and floss 3) frequent water changes for these nano size aquariums. 12g nanocube and I have some SPS and softies and only one small clown.... I have lots of rock and not much sand, actually it's crushed coral. I've been thinking of getting the AquaMaxx HOB 1 and the intank filter rack to hold chaeto and chemipure. Skimmers help remove fish poop and biodegrading fish food that wasn't eaten? Can I get away with chaeto, chemipure and a skimmer? or do I still need filter floss? I'd still use filter floss even with a skimmer. It's there to get the biggest particles out of the water, is easy and cheap. I don't have a skimmer on my BC14, just the intank media rack with filter floss and chemipure. I'm going to get some chaeto, just haven't yet since I have some macro algae in the display area.